The "Message" of the 9th Assembly is an invitation to prayer. In proposing the document for adoption, message committee moderator Wendy Evans explained that the message is neither a report nor an exhaustive listing of concerns, but that "the message reflects the heart of the Assembly". Evans, a delegate from the United Church of Canada, is the only committee moderator in the category of "youth". The committee brought three drafts of the proposed message to plenary sessions of the assembly, collecting suggestions for textual changes on each occasion. The final version of the message was agreed by consensus on the afternoon of the last day of the meeting, Thursday 23 February. Sisters and brothers, we greet you in Christ. 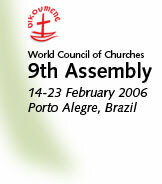 As representatives of churches from all the world's regions, we gather in Porto Alegre, Brazil, meeting in the first decade of the third millennium, in the first assembly of the World Council of Churches held in Latin America. We have been invited here to join in afesta da vida, the feast of life. We are praying, reflecting on the scriptures, struggling and rejoicing together in our unity and diversity, and seeking to listen carefully to one another in the spirit of consensus. Meeting in February 2006, we are made aware by Assembly participants of cries arising daily in their home countries and regions due to disasters, violent conflicts and conditions of oppression and suffering. Yet we are also empowered by God to bear witness to transformation in personal lives, churches, societies and the world as a whole. Specific challenges and calls to action are being communicated to the churches and the world in the reports and decisions of the Assembly, such as: the quest for Christian unity; our mid-term call to recommitment to the Decade to Overcome Violence (2001-2010); discernment of prophetic and programmatic means to achieve global economic justice; engagement in inter-religious dialogue; full inter-generational participation of all women and men, and common statements addressing the churches and the world on public issues. We have been unworthy servants. We have misused and abused the creation. We have wounded one another by divisions everywhere. poverty, racism, caste-ism, war and genocide. We are not only victims but also perpetrators of violence. who in his incarnation came to save us and teach us how to love. Forgive us, God, and teach us to forgive one another. God, in your grace, transform the world. distort memory and deny the possibility of reconciliation. God, guide all in seats of authority towards decisions of moral integrity. both in exceptional circumstances and every day. We thank you for the good news of Jesus Christ, and the assurance of resurrection. readily sharing the good news of Jesus Christ.